There was a time when small children and adults alike flocked to see the wonders created by water dripping onto a variety of objects and gradually giving them a stone covering. The Matlock Bath spring water contains calcium carbonate and some other salts so when the water comes into contact with a particular item, it slowly enshrouds it as the water evaporates, thus petrifying it. Petrifaction had grown as a local industry in the very early nineteenth century; Pigot's Directory of 1828-9, for example, shows seven petrifaction warehouses already established in the village. An early visitor to a Matlock Bath petrifying well was the eight year old Elizabeth Barrett, who later married Robert Browning. She describes her experience in one of her poems, written after the family's visit in 1814. Almost sixty years later, in 1871, the Emperor and Empress of Brazil Matlock Bath stayed overnight at the New Bath. The following day they visited the Petrifying Well near the Fishpond. 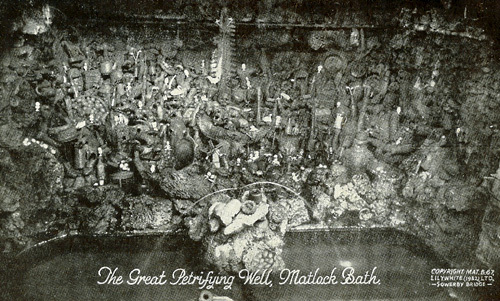 The postcard above, dated 1932, shows just some of the items that were being petrified at The Great Petrifying Well in Matlock Bath. Although they aren't easy to see, they included small mugs, teapots, jugs, pots of all shapes and sizes, plates, vases and bottles, crucifixes, leaves, nests, fruit and eggs, shoes, hats and even an umbrella. The type of thing people wanted to be petrified had changed since the nineteenth century, perhaps because the smaller the item, the more easily it could be taken away. And tastes had also changed. The water came from a pipe or spout in the roof of the well and slowly dripped from the holes in the pipe onto the objects below, which had been arranged on stands in tiers. Whilst the photograph above looks as if the items were becoming a solid mass, they were turned at regular intervals to ensure they were properly encrusted. It was a lengthy and time consuming process. 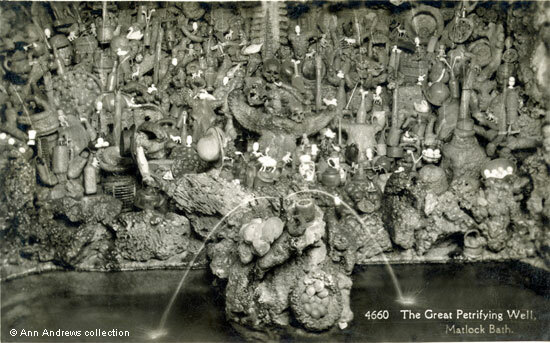 The second postcard shows some of the artifacts in more detail. 2. "Great Petrifying Well, Matlock Bath". H. Coates, Wisbech, Nene Series, No.A4660. Real Photograph, British Manufacture. Not posted but dated Summer 1938 in pencil. All research provided by and © Ann Andrews. This report was from the "Derby Daily Telegraph" of 17 September 1927, but the visit was also covered by the nineteenth century newspaper.